Cochinita Pibil is a pork filling Mexican food dish, popular in Yucatan southern Mexico. Usually made with pork but also with chicken and beef, that is boiled, shredded, then fried with ground chiles and other spices. Chata Products is a Mexican food company founded by the Machado family in 1962 that produces ready-to-serve authentic Mexican foods. Chata's TIF plant is located in Culiacan, Sinaloa Mexico. Chata is the Brand leader in Mexico for Chilorio, Cochinita Pibil and Chorizo Beans. Chata prepares traditional Mexican recipes, made with natural ingredients. No artificial flavors added.Chata manufactures more than 70 top quality products and innovation is their priority. 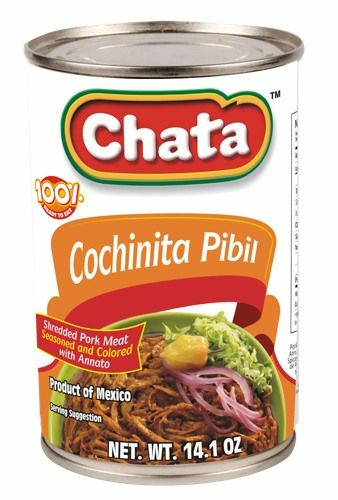 La Cochinita Pibil marca Chata se prepara a base de carne de cerdo deshebrada con un sazon delicioso a base de chile pasilla y especias. 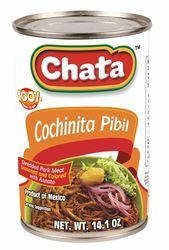 Chata es la marca lider en Mexico de Chilorio, Cochinita Pibil y Frijoles preparados con chorizo. Prueba el inigualable, tradicional y original Chilorio Sinaloense. This is a great item for a something different Mexican dish !